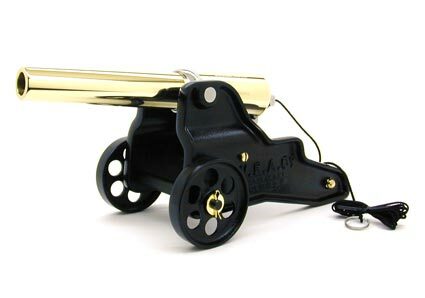 The Naval Edition Winchester Cannon has a highly polished brass barrel mounted on a standard black carriage, with brass hardware highlights. The barrel, machined from solid round brass bar is accented by the hand polished breech closure and trunnion. The stunning contrast between the brass barrel and black carriage have made the Naval cannon one of our most popular models. The Naval Edition cannon was first introduced in 2001 by the Bellmore Johnson Company and is the newest addition to the Winchester Model 98 collection. Manufactured under license from Winchester Division of the Olin Corp. The Naval Edition Winchester Cannon is available factory direct from the Bellmore Johnson Company. For pricing, availability and ordering please visit The Cannon Store or telephone, toll free: (800) 575-2171.